Take a look at what some of the participants in Made@City are doing now and how taking part in the event has helped to shape their careers. Made@City is an event held at City showcasing innovative and creative student projects, along with academic research and start-ups founded by recent graduates. The event is one of the biggest celebrations of student work at City, presenting projects from all schools across the University. During the event, the attending guests are given the chance to vote for their favourite projects and the winners are announced at the end of the evening. With applications opening soon for next year’s competition, students who have taken part in previous years share their experiences about how the event has helped to shape their future careers or study. Michelle Nomoni is studying at City for a four year degree in Biomedical Engineering. At Made@City 2015 Michelle presented her engineering project titled ‘Development of a Gesture Recognition System using Myoelectric Signals to Translate Sign Language’. Michelle’s winning project outlined the design for a device to translate sign language into a spoken language, using gesture recognition and myoelectric signals. Have you worked on this project since Made@City? Throughout the event it was constantly brought to my attention that I should consider applying for a patent. I followed this up with a patent search and discovered that six months prior to the event, a very similar patent had been granted in Shanghai. Although this news was disappointing, I used it as a source of encouragement. To know that my idea was only months late gave me the confidence to know that my ideas are relevant and current. What are the benefits of taking part in Made@City? Presenting at the event led me to meet many new faces, from both the University and local companies. Along with networking opportunities, it also provided a relaxed platform to help practise my presentation and communication skills. After the long hours and immense dedication developing your project, to have an event to show off your hard work is immensely gratifying and rewarding. I would highly recommend participating in the Made@City event to all students. Daniel Grewal studied Software Engineering at City, graduating in June 2014. He was the winner of Made@City 2014 with an application he created for his final year project that predicts sports results. Daniel built the machine learning application using Matlab and self-developed algorithms to predict football results over an entire season for an English Premier League football team. He now works as a Data Scientist for SAS, one of the largest analytics companies in the world. I am currently in the process of developing the project further to include more advanced statistical and machine learning methods as well as interactive visualisations using open-source software. I hope to make it available to the public via the web, so that they can use my predictions to make smarter bets on football results in the future. Taking part in the event gave me a clear idea of what I wanted to do in terms of my career. Winning the competition also meant I had a great addition to my CV. As the career path I wanted to take meant having to be educated to Master's level as a minimum requirement, it greatly enhanced my application to study for my Master's degree after I graduated from City. As a Data Scientist, I spend my day analysing outliers and data which diverge from the norm as they are interesting and sometimes very insightful observations that help discover meaning and hidden patterns in large, complex data. I would definitely encourage students to take part in Made@City as it will help them stand out from the norm and make potential employers, academic institutions/supervisors and tech investors identify unique talent in a pool of students all with similar abilities and ambitions. Michael Lashley studied Computer Science at City and was one of the winners of Made@City 2015. The project Michael presented at Made@City was an interactive geographical map to explore statistical trends in the 2011 UK census data. The platform delivers this through the use of multiple visualisation techniques and methods. After graduating he joined the National Grid where he now works as a Consultant Senior Java Developer. I definitely think that the Made@City event played a part in my career success and chosen path. The event equipped me with the confidence I needed to join the IT industry. Being able to showcase my project, findings and present to a wide range of people from industry experts to first year undergraduates helped me to hone my presentation and interpersonal skills in the space of a few hours. In addition, to achieving a first class degree at City, winning second place at the Made@City event was equally rewarding and my helicopter ride prize was the icing on the cake. 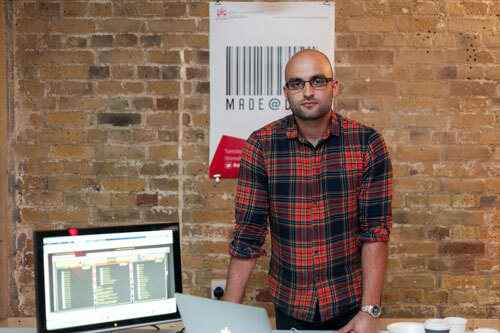 Would you encourage current students to take part in Made@City? Companies in the industry are looking for developers with the full package. They’re not just looking for developers, data analysts or project managers, but for students with the flexibility to adapt to new challenges and projects. Taking part in the Made@City event will not only give you a fantastic talking point for graduate interviews but also demonstrate that you are an all-rounded individual. You can understand the requirements, do research, plan, project manage, develop, test, document and present a project from start to finish, which is essential to a successful IT career. For more information, email Christine Kemp. Applications will open in January next year and current City students are encouraged to start thinking about their entries now. Alongside Made@City, Images of Research is a photographic exhibition showcasing some of the unique academic work from across City. Applications for the 2016 Images of Research competition will open on Sunday 1st November.